In my previous post, My Mathematical Zoo, I said that I would reveal the geometric shape that has a never-changing area but a perimeter that one can make as long as desired. Here is the shape! How was this shape born? It evolved from a square. 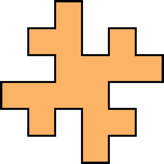 Gather 16 small squares (cut from paper) and form a 4x4 square as seen in this figure (color is not important). Let the side of the square equal one. 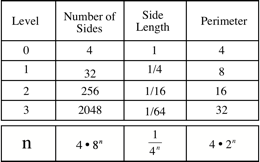 Therefore, each edge of a small square is one-fourth the length of the side of the square. Starting at the top of the square, shift the second square to the right to a position above the first square along the top edge. Continue this process in the clockwise direction. 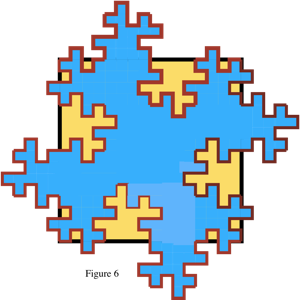 Now, let’s compare the area of the original square and its offspring, the funny-looking shape seen above. 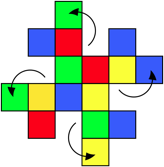 The original square has an area of 16 square units and a perimeter of 4 units. After shifting the squares, the area of the shape is still 16 square-units but the perimeter has increased to 8 units! We could continue on with area tiles but it takes a lot them and it’s easy to make mistakes. So. Let’s focus on the perimeter of one side. In Figures 1 and 2, I started with a line one unit long and then divided the line segment into fourths. Then building on Figure 2, I duplicate the shape of the top edge of the area tiles shape, as shown in Figure 3. Obviously, I can do the same to the other three sides to get the following shape as seen in Figure 4. 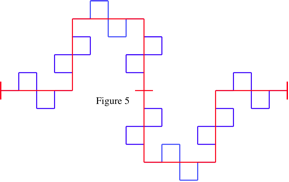 Note that the red line is identical to the shape we obtained by shifting the area tiles. The advantage of the line method is that it is easily extended. 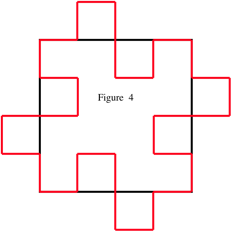 Each straight-line segment in Figure 4 can also be divided into fourths and the same figure as in Figure 1, at a reduced scale, can be drawn on each of the eight red line segments that make up the top edge. The result is shown in Figure 5. If the above construction is applied to all four sides of Figure 4, then the following shape, Figure 6, emerges. For comparison, I’ve colored the original square yellow. Those with an algebraic bent will appreciate the following generalization for the perimeter of this shape. Now do you understand why this shape is in my Mathematical Zoo? Isn’t geometry a wonderful construct of the human mind and imagination? Watch this short video and see how the curve I call the Squareflake is constructed. To view the Scratch program used to make the video click on the following link.